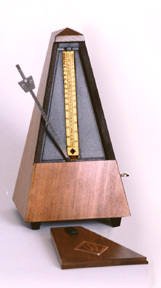 Classic Wittner Metronome is rated 4.39 out of 5 based on 104 ratings. Direct from Germany - Time tested designs and German engineering have kept Wittner the leader in metronomes since 1895. This key-wound classic wood metronome comes in a walnut, mahogany, (shown) black and hi-polished black finish. 8 1/2" tall. Latch on cover and adjustable weight on pendulum.